Cool, no? What I love about these pens is they feel perfectly balanced when using them to write with, not to mention the ink flow is consistent and fluent. How many times have you had to scribble on a scrap of paper to get a pen to write, then get disappointed when the ink flow is less than stellar? Another thing I love about these pens is that you can have them personalized any way you want – there are so many options and up to five lines of personalization – I don’t think I’ve ever seen any personalized pen have five lines available – two at the most. Very nice that you can get even more creative when having pens personalized. Navigating the site at Amsterdamprinting.com is really easy, too – I had no trouble whatsoever picking out font and size on the personalization of my cool new pens. They have many different pens to choose from style-wise and color-wise. I went for the obvious choice (for me) with the wine color, naturally. But you can go wild and crazy with all sorts of styles and colors, so personalizing them to your individual needs and style is no problem. I’m planning ahead since I’m a giver and am putting together a small handful of swag bags for my first foray at BlogHer in August, so these will be the perfect addition to the fun I’m putting together. 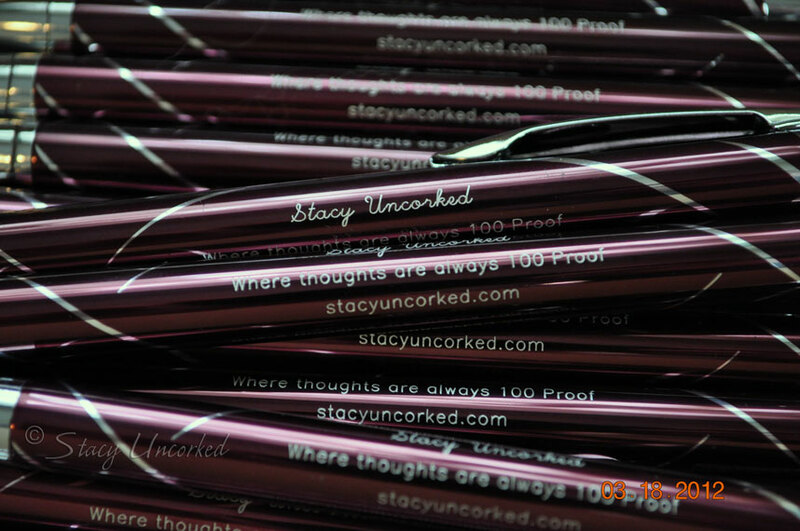 I love them so much I’ll probably be ordering them for my Wine & Gift Basket business too – a great way to advertise and have people remember you whenever they use the pens. How can promotional pens help my business? Imagine a business card that you can place in front of customers every time they take notes at a meeting, jot down a phone message, or even write out a grocery list. With a great promotional pen, that’s exactly what you’ll have. By providing a practical tool that customers and prospects will use every day, promotional pens and other writing tools are one of the most effective means of enhancing your business’ image. A recent study by the Advertising Specialty Institute ranked writing instruments as the #1 most-commonly-owned promotional item, with 54% of respondents owning at least one. Of course, any pen is only as good as its writing performance, so make sure you choose a quality instrument that can provide years’ worth of use for your customers… and thousands of impressions for your business. It’s also important to choose a pen that uniquely represents your business—that reminds customers of you and no one else. That’s why we offer a large selection of stylish, high-performance writing instruments, many of which you won’t find anywhere else. And with our easy ordering process, you can even preview your text imprint online to make sure it’s letter-perfect. (must be completed before any extra entries are valid) Leave a comment telling me how you will use your personalized pens for your business, organization, or personal use. You have until Midnight EST on April 1, 2012 (no fooling) to enter. 1 lucky winner will be randomly selected using the “And The Winner Is” plug-in. I will email the winner who will have 48 hours to respond to the notification email or a new winner will be chosen. Open to U.S. residents. Good luck! I was provided 50 Inspire pens of my own thanks to the generosity of Amsterdamprinting.com, along with their offer to gift 50 Inspire pens to one of my lucky readers. No other compensation was received for this post implied or otherwise. The opinions are all mine and not influenced by any outside sources. See my Disclosure Policy here. 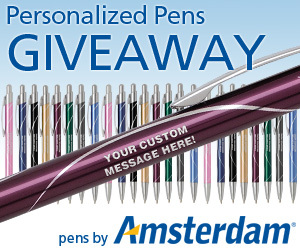 This entry was posted in Giveaway, Review and tagged amsterdam, cool stuff, Giveaway, personalized pens, promotional pens, Review by Stacy (the Random Cool Chick). Bookmark the permalink. Those are some nice looking pens! I would use them to promote my blog at conferences. These are so cool!! I could see using them to ad. by blog. This would be great. wow cool! Nice pens. I think I would use them for promoting my blog. Thank you for giving this chance. Nice Pens. I would use them to promote my photography. I follow you on Twitter (@anjathisandthat) and tweeted. Click HERE to see tweet. I blogged about the giveaway. Click HERE to see blog post. Never have enough good pens! I will use my personalized pens to help me stay prepared in college. I would use these pens at work. People are always taking my pens — this way I would know for sure they are mine! I would note every morning my to-do list with these beautiful pens! Now a days the promotional products are the perfect advertising idea for brand promotion. 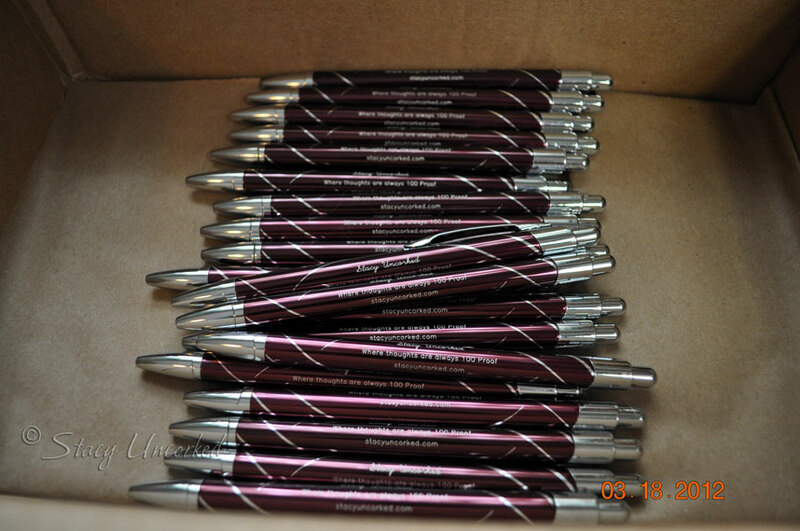 One of the promotional products is pen, People can spend a great deal of time in public writing with personalized promotional pens. Click HERE to see tweet. I just love personalized things. If these pens, by chance, turn out to be American-made, I would use them to spread the word at conferences about my site, USA Love List, which celebrates outstanding products made in the USA. If they are not, I would use them as a year end thank you gift for everyone in my community who volunteers for Girl Scouts, because they work hard to develop young women of courage, confidence, and character who will make the world a better place. I would use them to promote my blogs. I hope I win!